Biotin is also referred to as vitamin H, which also plays a role in forming vitamin B complex. As an essential part of human body, vitamin B helps in the production of energy by converting carbohydrates into glucose, and the breakdown of protein and fats into small soluble building blocks. Besides, it also helps with proper functioning of the nervous system. However, recently some people apply biotin to help with hair growth, and you must have probably seen numerous photos of using biotin before and after on the internet. So, does biotin really help with hair growth as so many people claim? Can Biotin Help With Hair Growth? With so many pictures of using biotin before and after for hair growth, you may still wonder this question, can biotin work for hair growth? Some doctors assume that there is not definite scientific basis to support the claim that biotin does help with hair growth. Also, biotin won't work for everyone and could cause some unpleasant effects (such as acnes and breakouts). 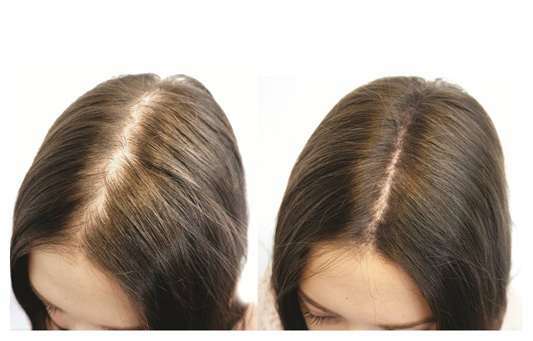 If you have any concern before using biotin for hair growth, you need to consult your doctor before using, especially for pregnant mothers and children. Although science won't give affirmative support, there are many people that have reported tremendous results with pictures or videos on the internet. According to people's real experience, you will get longer, stronger and fuller hair with using biotin for about 6 months continuously. Hair breakage can be reduced, which further helps with hair growth in a short period. Besides, biotin also replenishes the follicles and roots of your hair, making your hair looks great with beautiful hair color. I take three tablets of 5,000mcg biotin daily for a few months. I have been taking biotin tablets on and off for four years. After a month of biotin, I noticed new growth at the crown of her head, with amounts of baby hairs popping up. I was also losing less hair during washing and styling. However, biotin caused a few pimples to pop on my face. Despite that, my hair was fuller and stronger. As an African American woman, I try to take biotin to help with my hair growth. I have been taking one 5000mcg Biotin pill combined with one mega-multi vitamin and one 1000mcg MSM daily. After using Biotin for 10 weeks, I have recorded substantial new growth on my 4A/4B hair. Here is a video that a girl shares her experience on using biotin to help with hair growth. The recommended daily dosage of biotin is about 2.5mg per day. For starters, a recommended dosage is no more than 1000mcg. You can gradually improve your dosage with observing the body's reactions. The right dosage for full effect is not known. It is, however, important to contact a doctor to avoid overdosing. Signs of biotin overdose include skin rashes, high blood sugar levels, slower release of insulin and lower levels of vitamin C and B6. Biotin pills for hair growth – Biotin pills for hair growth come in many forms and brands and various forms, including tablets, capsules and liquid gel. Liquid gel supplements are preferred compared to other forms since they are the easiest to digest. They include hard gel capsules, soft gel or liquid capsules and vitamin tablets. Biotin oil for hair growth – Biotin constitutes a major part of various hair products including shampoos and oils. Hair oil containing biotin helps moisturize thin and dry hair, restoring sheen and strength. Along with regular cleaning and trimming, you will see improvements on both hair growth and health. Biotin hair shampoo – Biotin is included in hair shampoo to provide nutrients for fragile, thin hair. These shampoos also contain collagen, which helps to improve hair volume. Circulation boosters and amino acids assist in achieving optimal growth. Your hair cannot grow overnight after taking biotin supplements. Biotin only supplements your healthy diet - you have to combine it with a good hair care regimen for your hair to grow faster and longer. Biotin absorption may be inhibited by alcohol and antibiotics, which also destroy B vitamins that occur naturally in the body. This can affect the results of using biotin before and after. Besides, people using antibiotics should stop taking biotin until they are through with their medication. Vitamin B is known to help with cell metabolism. As part of vitamin B, biotin should be taken along with vitamin B complex to balance the portion and avoid the occurrence of acnes. Remember to control your intake of vitamin B3 (niacin) with no more than 35mg and vitamin B9 (folic acid) with no more than 1mg per day. You need to track the results after taking biotin timely. Long period of taking the biotin without expected results can harm health. Usually, you can see some improvements for about 2 months. Also, as a known fact, side effects of any medicine cannot be eliminated with precautions. Proper diet and physical exercise can be a longtime running plan for hair growth.